The Grassland Biome is found chiefly on the high central plateau of South Africa, and the inland areas of KwaZulu Natal and the Eastern Cape. Most of the Witwatersrand falls within this veld type. 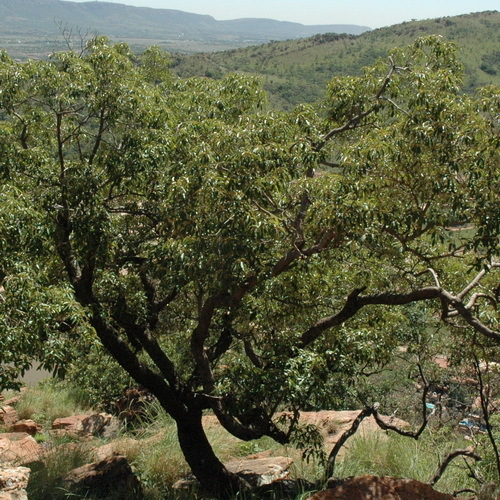 Hartbeespoort is a transitional zone with many plants from the Bushveld (also known as the Savannah Biome) also occurs in this area. One tends to think of the Highveld as mainly grass with very few trees, but on the scattered koppies in this region there is really a wealth of plants eminently suited for the garden that also support many creatures. (That is why townhouse complexes don’t belong there). An open area in the garden will attract a wide variety of birds, but need careful planning – the visitors can be very whimsical. It should contain one or more trees that can form a canopy, some shrubs to hide in if need be and the rest to feast on. One of the old stalwarts is the white stinkwood, Celtis africana. In gardens it can reach a height of 5-8 m. The leaves are a delicate pale green in spring, becoming dark green when mature. The small yellow fruit is a great favourite with birds and it is also a good nesting tree (be wary of the imported varieties of the white stinkwood, such as Celtis sinensis, since they can become invasive). A tree that should be planted more is the jacket plum, Pappea capensis. It is evergreen and is not too dense or too tall for a garden. The leaves are mid-green, leathery and quite often very serrated. 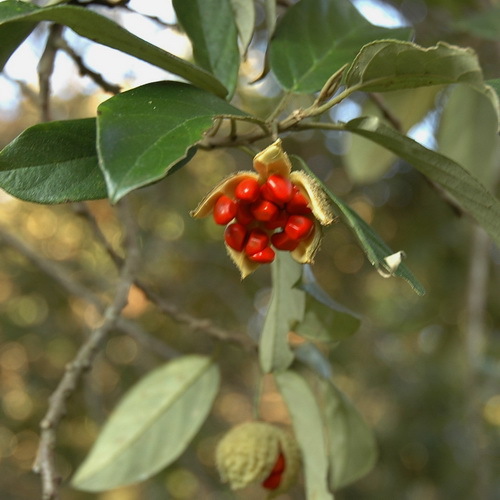 The fruit is a green, round capsule and when it splits open on maturity, it reveals blackish seeds covered in a red jelly-like pulp, which is delicious. Fruit eating birds can’t resist it. It is slow growing, but really worth the effort. Plant more than one tree if you want fertile seed since the male and female flowers are borne on separate trees. It can withstand moderate frost. A tree that is also worth the effort is the wild peach, Kiggelaria africana. The leaves are dull and pale-green and resembles that of a peach tree, but that is where the analogy stops. The fruit is a rough, knobbly capsule that opens in spring like a five-pointed star. The seeds inside are a brilliant orange and much favoured by birds. 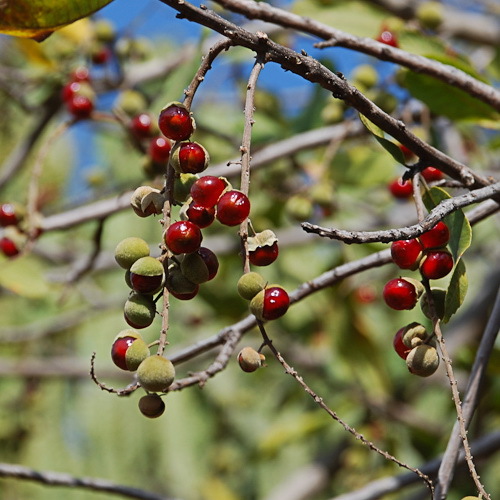 For the more adventurous, the Transvaal red milkwood or moepel, Mimusops zeyherii, will provide a lovely shady spot in the garden where one can relax and watch life (or birds) go by. It is tender to frost when young and needs protection for the first two years. The fragrant, white, star-like flowers appear from October to December. The cherry like fruit ripens in early winter and makes a lovely jelly. Expect vervet monkeys in your garden! It is not recommended for very cold areas or very small gardens. If you live in an area where the soil is quite sandy and the frost not severe, try the plane tree, Ochna pulchra. This tree is always beautiful. The new leaves are a pale apple-green in early spring with a bronze tint. Flowers are lemon yellow and shaped like a buttercup. 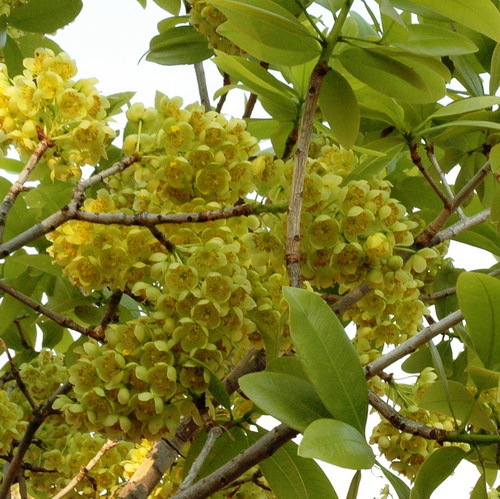 When in flower, the tree becomes alive with all the insects that utilise it. When the seeds ripen, the outer seed leaves become a bright red and the berry-like seeds inside are pitch black. The whole effect is absolutely breathtaking. Even in winter, the pale, grey bark that peels off in flakes, reveal a creamy-white wood effect underneath. It almost reminds one of the bark of a Eucalyptus. All the trees mentioned occur naturally in our area, but obviously there are many more that are suitable eco partners. Also remember that the best protection against frost is to keep your trees as dry as possible in winter.